It was the third day of our trip. And it was Easter Sunday. 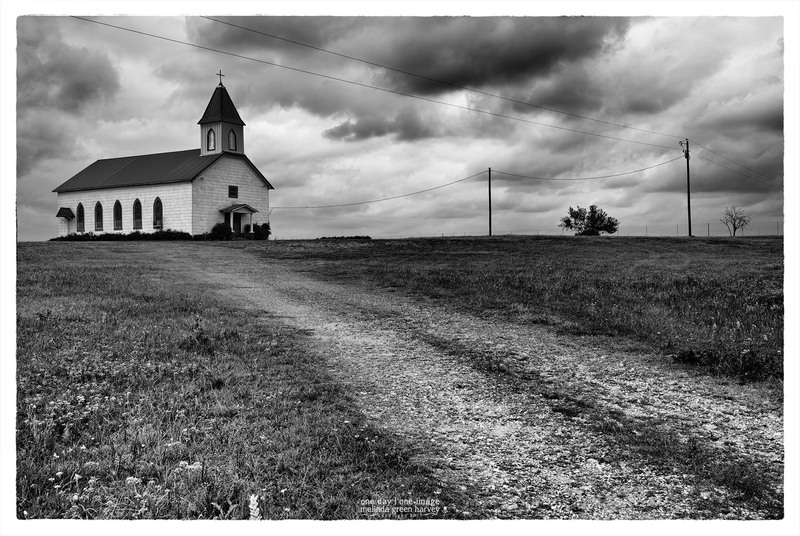 Posted on April 23, 2017, in Photography and tagged 365 photo project, architecture, black and white photography, church, learning to see, Leica, melinda green harvey, monochrome, one day one image, photo a day, photography, postaday, texas, thoughtful seeing. Bookmark the permalink. 10 Comments. As you can easily tell from even a short visit to my blog, my first love is monochrome. I’m glad you like it. See, I didn’t even THINK of that! What a great image this is, Melinda. A lovely lead-in from the Rt corner. Thanks, Andy. We turned down a little road because a sign on the highway indicated there was a cemetery. We found this church first, and then, when we eventually located the cemetery, it was kind of boring so we didn’t even get out of the car. The church was a hard act to follow! It is beautifully composed – the driveway and power poles and bushes perfectly arranged. And the sky was very cooperative too. Reminiscent of the best of Orest Semchishen, except better. Thank you, Julie! It was a lovely site, with that church set up on a little rise and that big lawn with no trees: all of those things were gifts to wandering photographers.